Responses of fibers in the DAS to 20 μsec rarefaction clicks. A–C, E, Type IV; D, type III; F, G, type Oc. Suprathreshold levels (dB) are indicated above each PSTH histogram. For cells inA and B, responses at two levels are shown. Note that the latency of the excitatory response at low suprathreshold levels (left) is shorter than at high levels (right). Number of bins = 250. Number of repetitions: A, 500; B–D, 1000;E–G, 200. Responses B–G were obtained from the same animal. Ordinate scales on bottom apply to all histograms. A response of one spike/click, exactly timed in one 40 μsec bin, would give a response of one spike/stimulus per bin. Comparison of latencies in DCN, DAS, and auditory nerve, measured for three types of stimuli. A, Minimum click latency. Type II cells were unresponsive to clicks and are thus not represented. B, Minimum latency to 25 msec tone bursts at CF. 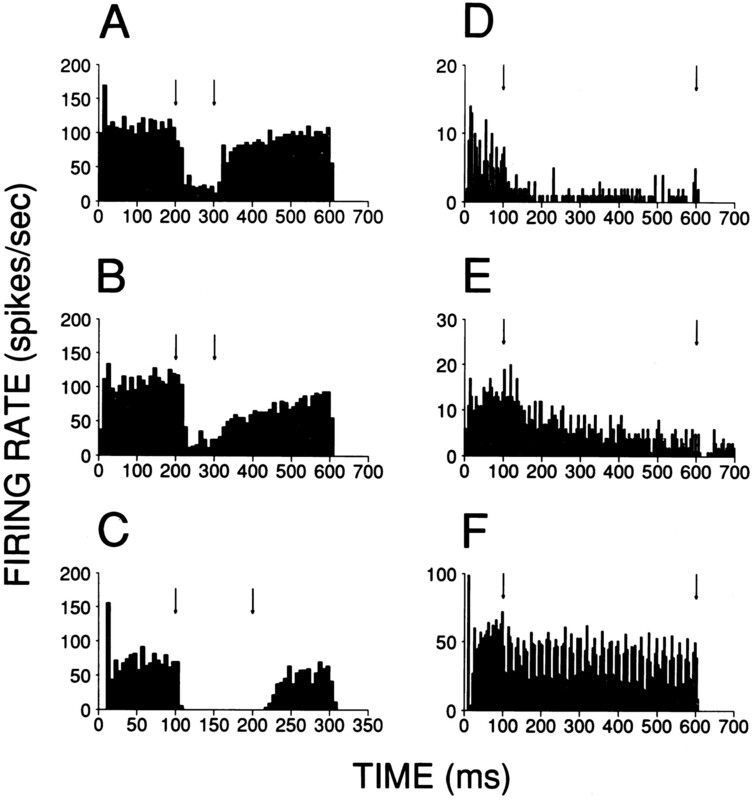 Symbols carrying upward arrows indicate responses for which shortest latency was >10 msec. C, Group delay measured from the slope of the phase-frequency function derived from responses to amplitude modulation. Datapoint for one type II cell (CF = 9.5 kHz) was shifted to lower CF to avoid overlap. Auditory nerve data in A and B are from a single experiment, whereas those in C are from the study by Joris and Yin (1992). Measures in C are corrected for acoustic delay, which was ∼0.28 msec (∼0.40 msec for auditory nerve experiments in C) as measured from the phase-frequency slope of the acoustic calibration curve. Responses to AM tones for an Oc (left column), type II (middle column), and type IV unit (right column).Bottom panels show rate-level functions to unmodulated CF tone bursts (+; duration 25 msec for A, B, 100 msec for C), to AM tones (×), and to broadband noise (▪). Middle panels (D, E, F) show the synchronization-level (Rm, ○) and phase-level (φm, ⋄) function calculated from the same AM response. Synchronization magnitude is quantified with the vector strength Rm, a dimensionless quantity varying between 0 and 1. Phase φmis given in cycles and is not shown if Rm is not statistically significant (indicated with •). Histograms (top) are cycle histograms at three selected SPLs, indicated with arrows in the middle panels. Modulation depth of AM tones was 100%, carrier frequency was at CF, and modulation frequency (fm) was 100 Hz. The Oc and type IV unit were recorded from the stria; the type II was recorded from the DCN. CFs were 24.8, 9.5, and 8.8 kHz, respectively. Examples of period histograms, binned at the modulation frequency fm, for six cells of each response type. For each cell, two histograms are shown: at a low SPL (left, ≤45 dB) and a high SPL (right, ≥65 dB). 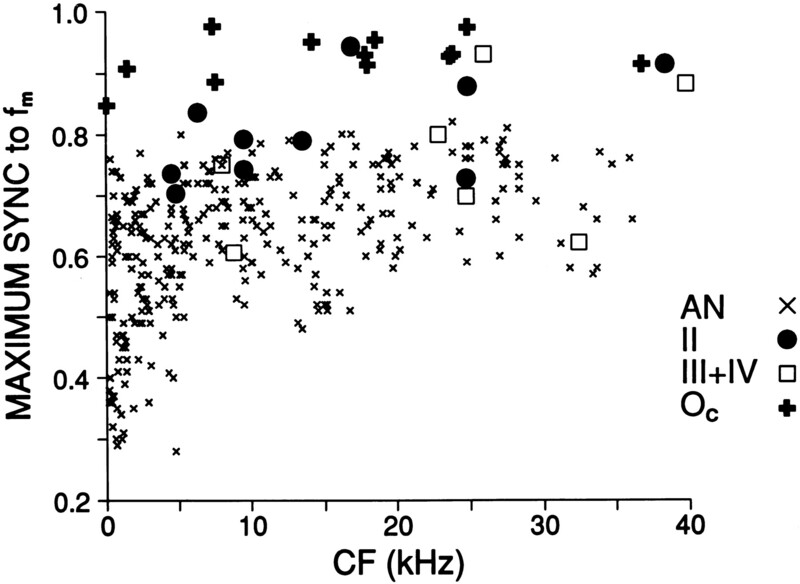 fm was 100 Hz except for one low-CF Oc cell (top row, CF = 1.4 kHz) for which 50 Hz was used. 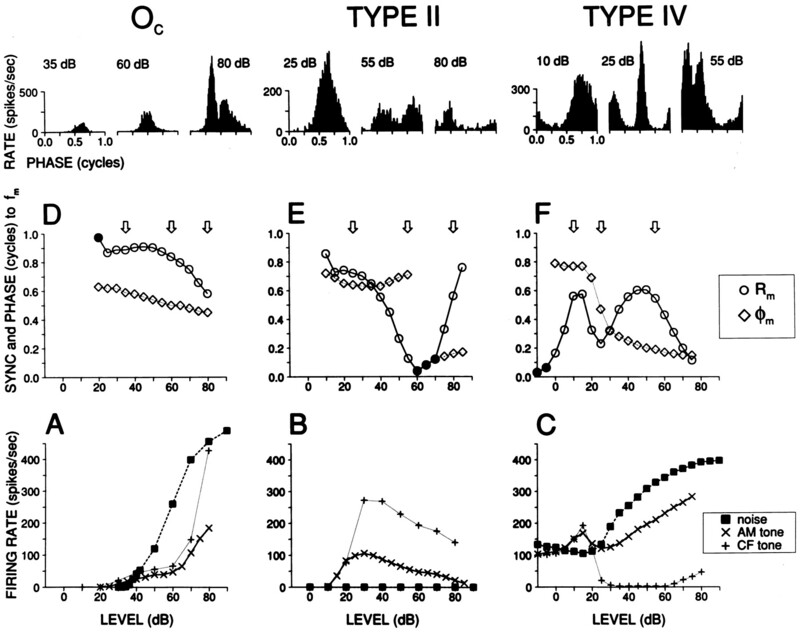 C, Histograms on the first and second row were from type III cells; others were from type IV cells. 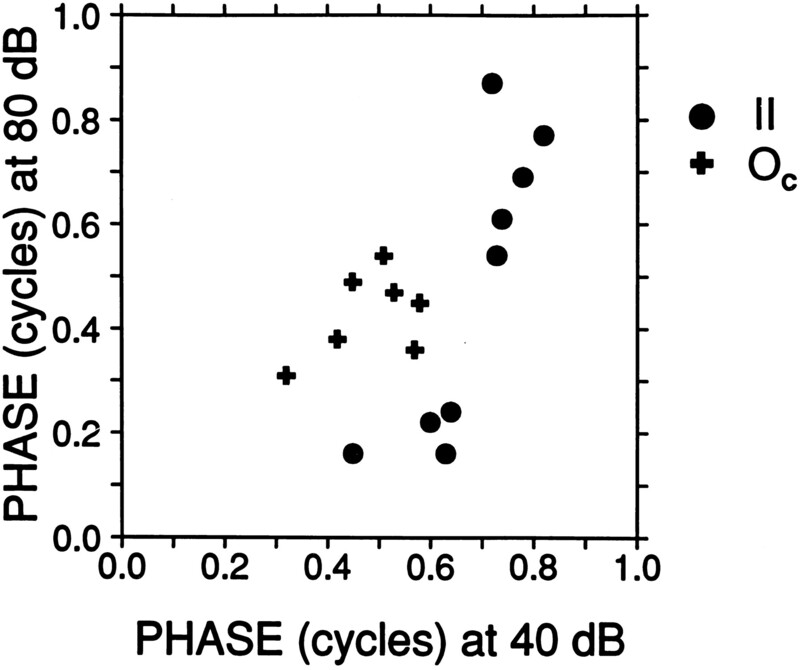 Comparison of phase tofm, for type II and Occells, at low (abscissa) and high (ordinate) sound level. Each datapoint shows response phase for one cell at 40 and 80 dB SPL, or at the nearest SPL that gave significant synchronization (low SPL was taken at 45 dB in 1 cell; high SPL was taken at 70 dB in 3 cells). 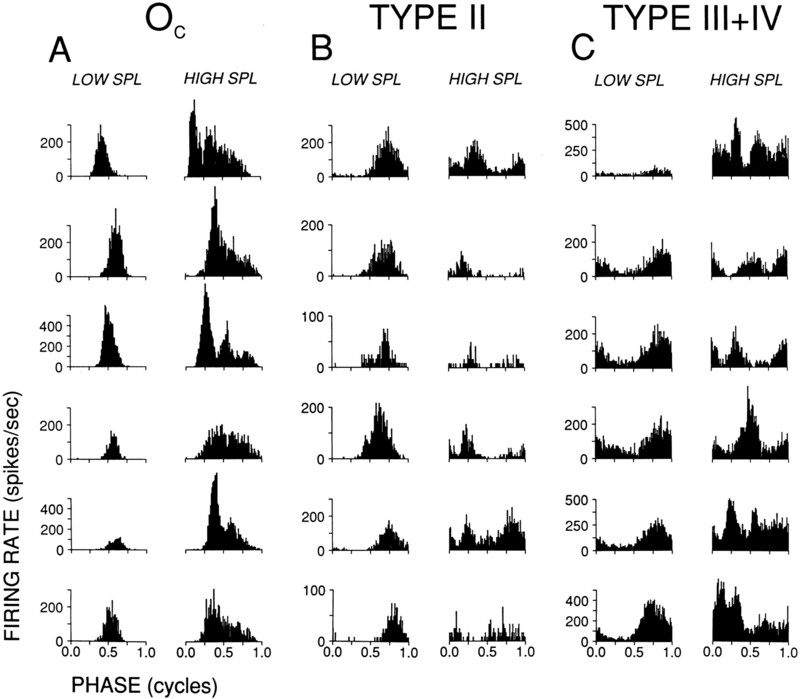 Distribution of phases of Oc cells was within a narrow range at both low and high SPL (range = 0.26 and 0.23 cycles, respectively; median phase = 0.51 and 0.45 cycles). The distribution of type II cells was within a narrow range at low SPL (0.37 cycles; median phase = 0.72). At high SPL it was more dispersed and showed an absence of values over the range at which most Oc cells responded, consistent with an inhibitory input of Oc to type II cells. Maximum synchronization values tofm, for DCN responses classes and a population of auditory nerve fibers [auditory nerve data are fromJoris and Yin (1992)]. A, Modulation transfer functions for different response classes in DCN. Oc,Dashed lines; type III+IV, solid lines. Only one cell in the III+IV group was type III. Range of SPLs was 20–55 dB for type II (n = 8), 10–50 dB for type III+IV (n = 5), and 30–70 dB for Oc(n = 6). B, Examples of cumulated phase-frequency functions for cells of similar CF of each response type. CFs were 25.9 (type IV), 24.7 (type II), and 23.6 (Oc); SPL was 30 dB. 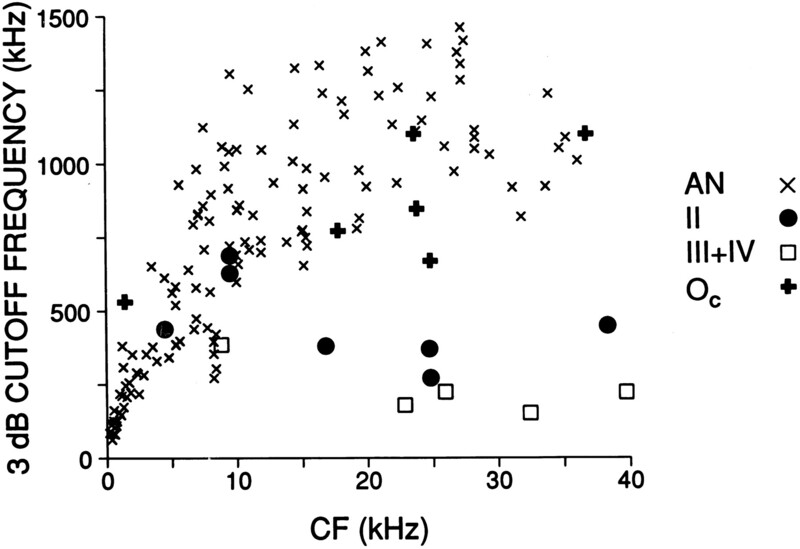 Comparison of cutoff-frequencies of modulation transfer functions in auditory nerve [AN; data fromJoris and Yin (1992)] and the DCN, as a function of characteristic frequency. Some of the type IV and Oc units were recorded in the DAS. The type II cell with notched MTF in Figure7A is not included. 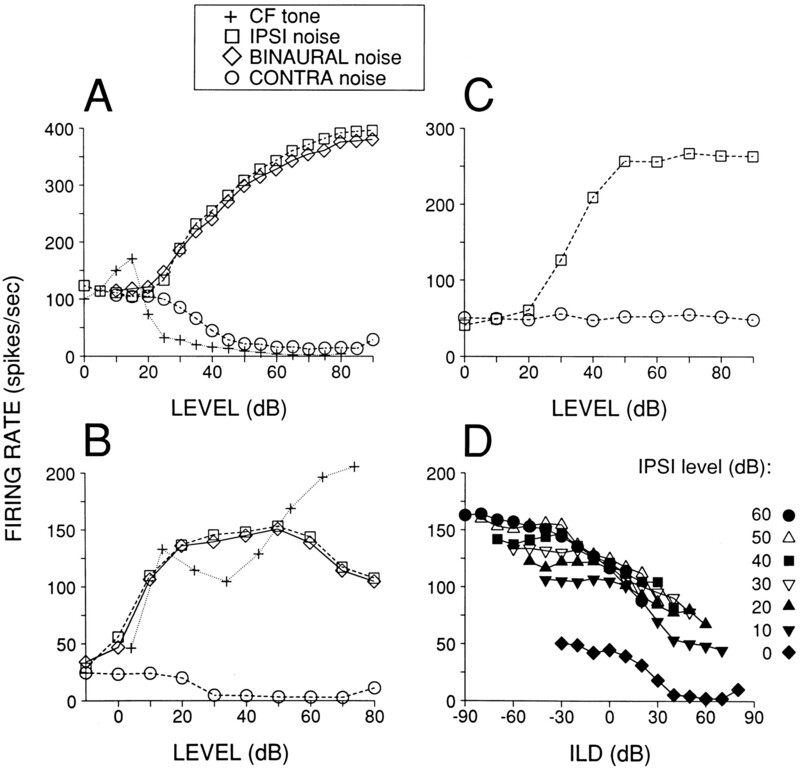 Effects of contralaterally presented broadband stimuli on spontaneous and ipsilaterally evoked activity.A–C, Responses to monaural and binaural (equal level) stimuli. A, DAS type IV cell, CF = 8.8 kHz.B, DAS type III cell, CF = 5.7 kHz.C, Auditory nerve fiber, CF = 11.8 kHz.D, Noise interaural level difference (ILD) functions for the same cell as B. The level of the ipsilateral noise burst was held constant at the level indicated in the caption, whereas the contralateral level was varied. In all cases binaural stimuli were gated simultaneously, and differences in phone maximum output levels were <10 dB, as measured in a one-third octave band around the CF. Duration was 25 msec for CF tones (A, B: +) and 50 or 100 msec for noise bursts. The upward inflections of the rate-level functions at the highest contralateral levels (A, 90 dB; B, D, 80 dB) were interpreted as the threshold of acoustic cross talk. Summary of spontaneous rate, maximal rate to ipsilaterally and binaurally presented noise, and minimal rate to contralateral noise (DAS recordings, ○; DCN recordings, ⊙). The first seven cells were tested only with monaural contralateral noise. The effect of binaural noise was tested in the last 14 cells (cells 39–52). 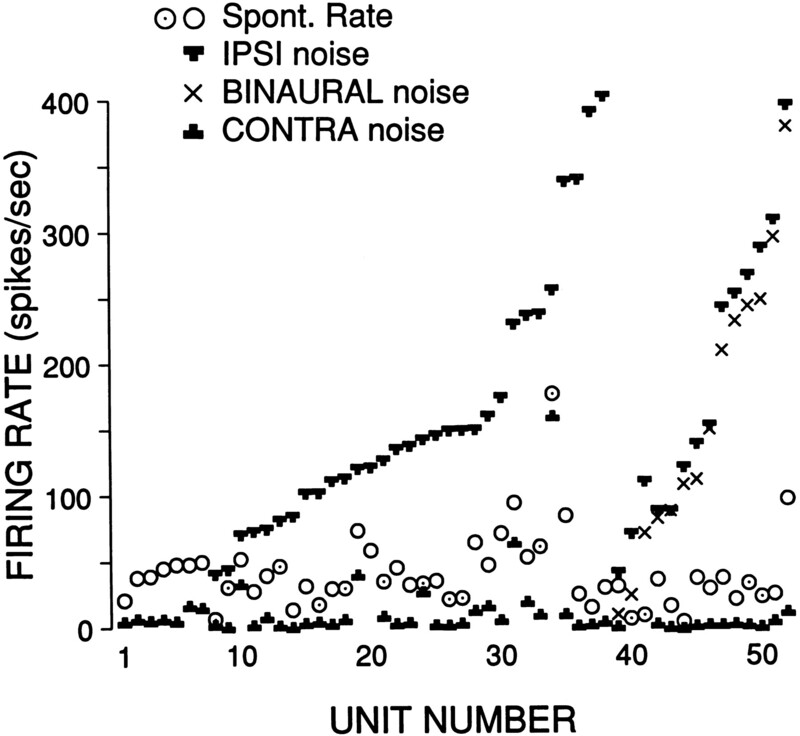 Within groups, cells are ranked according to increasing response to ipsilateral noise (increasing spontaneous rate for cells 1–7). 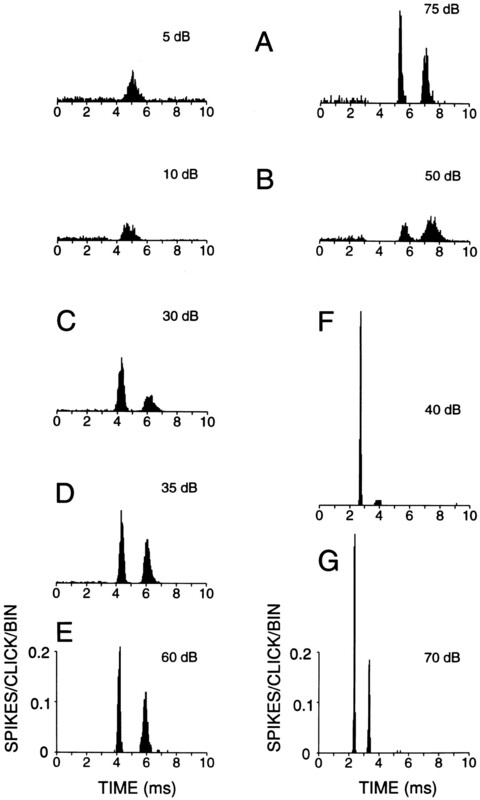 Inhibition to binaural noise was observed in only one cell (cell 39). Some cells were not classified because of short recording time (n = 16; almost all in DAS). All other cells were type III+IV. The excitatory response of a type III cell to an ipsilateral CF tone of increasing SPL is inhibited by a contralaterally presented broadband noise (left column) or tone (right column). The ipsilateral CF tone (10 kHz) was identical for both columns: it started at 0 msec and was 200 msec in duration, and its SPL was increased in 10 dB steps, as indicated on theright. The contralateral stimulus was delayed by 100 msec relative to the ipsilateral stimulus, its duration was 50 msec (brackets on top), and it was at a constant level (left, 59 dB, measured over one-third octave centered at CF; right, 80 dB SPL). These responses are from the cell with the largest inhibition to contralateral tones in our sample. Time course of contralateral inhibition in three cells. Each row shows responses for one cell. The ipsilateral ear was stimulated with a CF tone at a low SPL (A–F, 25, 20, 25, 10, 10, and 35 dB), which started at 0 msec and was 600 msec in duration (300 msec in C). The contralateral ear was stimulated after a delay of 100 or 200 msec (onset and offset indicated by markers). A–C, Stimulation of the contralateral ear with a broadband noise (A, B) or tone (C, same frequency as ipsilateral ear) caused inhibition. This inhibition was rapid in onset and was sustained over the duration of the stimulus (100 msec). Contralateral levels were 85, 62, and 80 dB SPL. D–F, These same cells showed inhibition to a 500 msec contralateral tone that was amplitude-modulated at 50 Hz, but only for the cell shown inF did the inhibition entrain to the stimulus envelope. Contralateral levels were 80, 60, and 80 dB SPL. Response type, recording site, and CF: top row, type IV in DAS, 14.7 kHz; middle row, type III in DAS, 4.3 kHz; bottom row, type III in DCN, 10 kHz. Binwidth is 10 msec in A, B; 5 msec in C; 4 msec inD–F. Population responses to ipsilateral and contralateral noise in auditory nerve and cochlear nucleus.PLN , Primary-like-with-notch;CHOP, chopper. 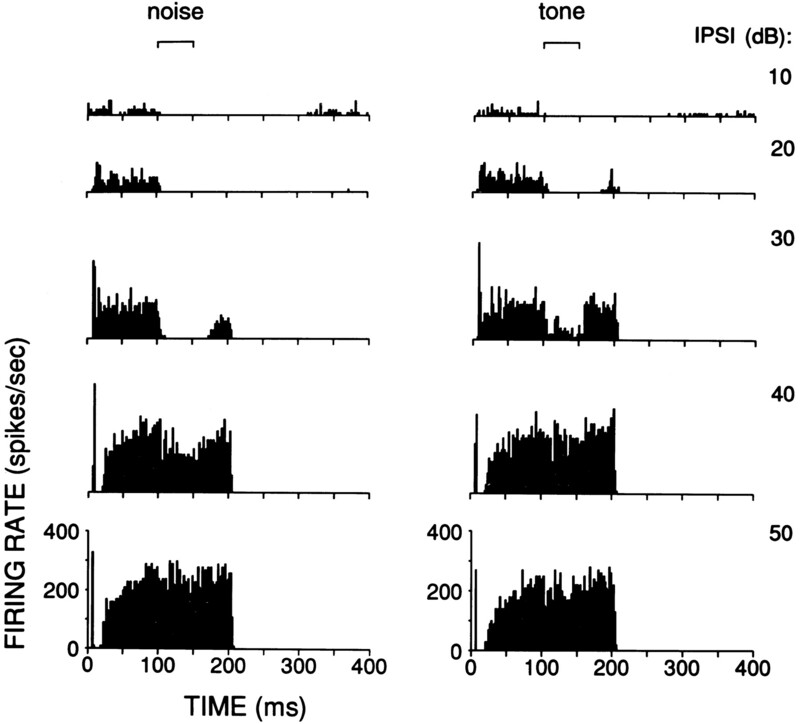 PSTHs are responses averaged across cells to an identical stimulus (broadband noise at 70 dB, rise/fall time of 4 msec, starting at 0 and 100 msec in duration) at either the ipsilateral (left column) or contralateral (right column) ear. 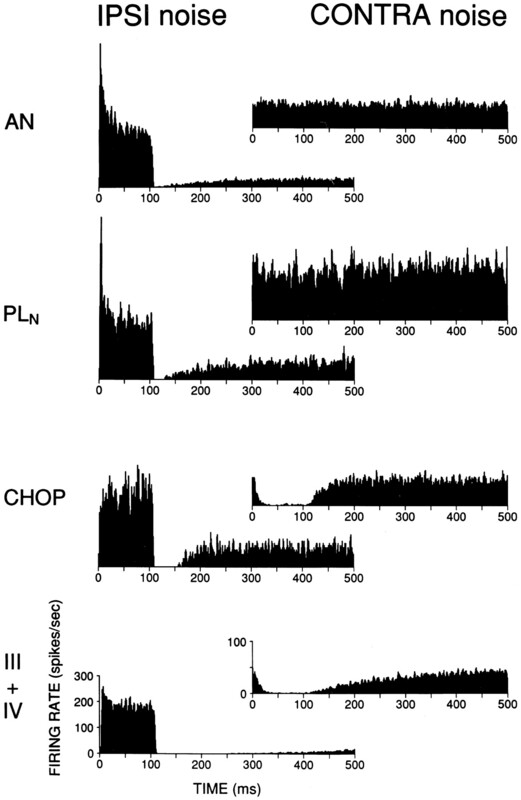 The same cells were used in construction of left and right histograms (number of cells: AN, 11;PLN , 3; III+IV, 20), except for the chopper class (n = 2 for IPSI,n = 6 for CONTRA). Binwidth is 1 msec. Scales for histograms on bottom apply to all histograms in a column; note the difference in scale for left and right column.